Ian McEwan’s most recent novel is one of those seemingly straightforward narratives — a story that is unpacked so subtly over the course of 300 pages that when the twist is finally revealed, the reader immediately turns the book over to flip back through it. Sweet Tooth isn’t a symbol-ridden, labyrinthine tangle of structure and plot, however. Ostensibly it is a straightforward tale of one woman’s 18 months of employment by MI5, Britian’s intelligence agency, and of the love affair she has while operating as an undercover agent. 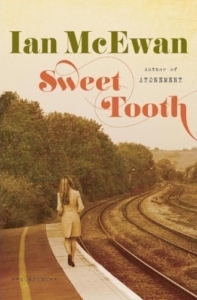 With Sweet Tooth, McEwan delivers a wry and springy novel whose good fun masks the book’s subterranean layers about the art of creating fiction. In the early 1970s, Serena Frome, a young woman bereft of ambitions outside of men and novels, is recruited into MI5 by a married lover who breaks if off with her on a dusty roadside. She is, by her own account, of average intelligence but above-average looks: “People told me I was beautiful and I believed them.” At MI5 she lusts after a colleague, watches other women in her class of entry receive promotions, and is eventually recruited for a project code-named Sweet Tooth, an operation that secretly funds writers (through a reputable third party to mask the government’s involvement) to help win the war against Communism. As her boss says drily, it’s “a slow-burn thing.” Any professional drive Serena had through the operation is rapidly subsumed into her youthful desire when she falls immediately into a relationship with one of the operation’s targets: a short story writer named Tom Healy. Serena, even when she’s overly sentimental, is a charming and funny narrator. She is completely convincing as the eldest, eager-to-please daughter of a provincial Bishop, a 23-year-old young woman caught between the hippie-dippy 60s and the stern Thatcher 80s. One of Serena’s most endearing character traits is as a passionate, though undiscerning, reader of novels, and she consumes Jane Austen and Ian Fleming with equal delight. The choice of these two authors is McEwan’s sly nod to the genres alluded to in Sweet Tooth. “How can one understand the inner life of a character, real or fictional, without knowing the state of her finances?” Serena asks before adding: “Miss Frome, newly installed in diminutive lodgings at number seventy St Augustine’s Road, London North West One, had less than one thousand a year and a heavy heart” (emphasis in text). Serena’s choice of the word “character” is a telling slip, the type that nestles in one’s brain without immediately setting off any alarms. It’s only as the story progresses that the word creeps to the surface again, at the moment when the alleged facts are pulled away to reveal a new narrative woven from the disconnected debris of the interrogation room. McEwan doesn’t return to the original story at the end (beyond a couple of unfortunate tying-up-the-box moments) to point out the clues he’s littered along the way; he trusts his reader enough to make the connections for herself. Despite a protagonist who works for MI5, Sweet Tooth is not at all a spy novel, though there’s plenty of espionage, mystery, false identities, betrayal, and a bit of treason to justify the setting within the intelligence world. Operation Sweet Tooth is about the creation of art, in particular fiction; similarly, Sweet Tooth is about fiction writing and the creative process. I took pleasure in McEwan’s matter-of-fact observations about the business of writing and publishing, and I shared McEwan’s evident delight in poking fun at the pretentiousness within literary circles and in acknowledging the general public’s complete lack of awareness of the literary world. I wasn’t impressed by those writers . . . who infiltrated their own pages as part of the cast, determined to remind the poor reader that all the characters and even they themselves were pure inventions and that there was a difference between fiction and life. Or, to the contrary, to insist that life was a fiction anyway. Only writers . . . were ever in danger of confusing the two. What makes the meta-layering of Sweet Tooth successful is the hyper-realistic way the novel is steeped in the geopolitical issues of the early 70s, from Serena’s observations on the IRA’s terrorism to a memo she types about the interception of an arms shipment from Colonel Qaddafi of Libya. McEwan’s great triumph is that he never lets the meta-narrative get in the way of telling an excellent story. When the big reveal happens, I’m willing to accept McEwan’s tricks because of his careful, earlier staging down to the minute detail. As Serena’s colleague and one-time lover Max says: “In this work the line between what people imagine and what’s actually the case can get very blurred. In fact that line is a big grey space, big enough to get lost in. You imagine things — and you can make them come true.” Though Max is referring to intelligence work, it’s a perfect statement about the possibilities of the artistic imagination and, in tandem, the reader’s willingness to get lost in the writer’s created world. In Sweet Tooth, McEwan takes advantage of that grey space — though thankfully not of the reader — and fills it with all the curiosities and pleasures that accompany a damn good book.